About 8 years ago, the IT specialist in the Emory chemistry department, Brian Adams, took a medical leave to receive a kidney transplant. He recovered strongly and returned to our department for a short time after the surgery. However the Emory IT administration regularly moves its personnel around to different departments, and I didn't keep up with Brian after he moved. More recently, Bonnie and I have become friends with Beverly Ford and Brian Minor, initially meeting in the Tucker Running Club. We were on a double date last summer, the night before the Hotlanta Half, when Beverly told us that she had donated a kidney to her brother several years ago. When Beverly mentioned that her brother worked in IT at Emory, and she told me his name, I realized that I had known him - small world! Since then, we have reconnected with Brian Adams on a few occasions, most recently at a party to celebrate the engagement of Beverly with Brian Minor - he proposed at dinner after the Publix Georgia Marathon and Half Marathon in March. Brian Adams is doing well, working with the Emory Department of Music in recording student recitals. Beverly fully recovered long before we met her. Brian Adams and Beverly Ford, recipient and donor! 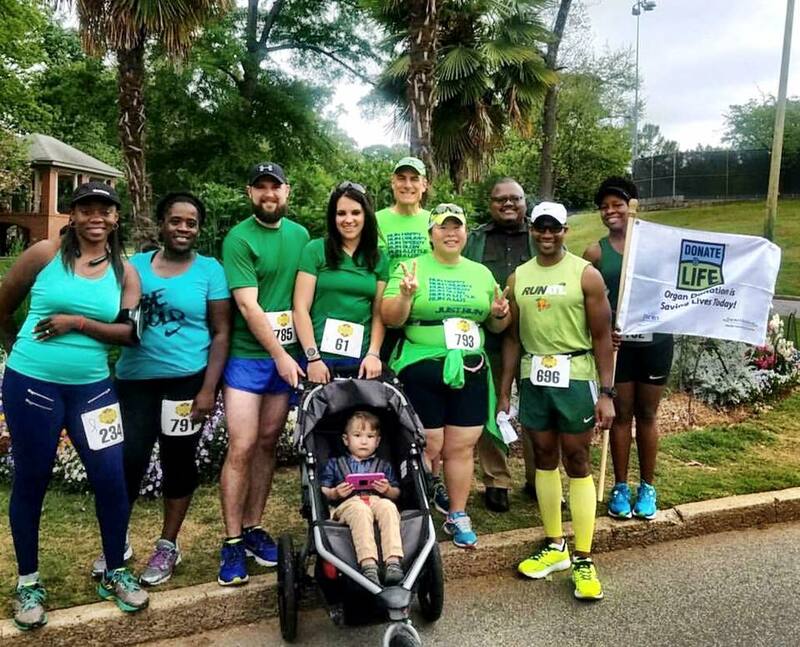 Earlier this spring, Beverly and Brian told us about the Run 4 Your Life 5K sponsored by Donate Life Georgia. They formed Team Green, which we were happy to join. We set aside our favorite green running shirt for today's run, which we had received at our first trail race in August 2015! Team Green drew 8 runners to today's event. Brian and Beverly arrived with a large "Donate Life" flag. We asked if they were going to run with the flag, Beverly didn't think so, but I encouraged Brian to consider it - and I told him that I might have a chance to keep up with him if he ran with the flag! Team Green is ready to run! The weather forecast had predicted thunderstorms overnight into the morning, with 80% chance of thunderstorms at 9 am, when the race was due to begin. I was concerned that the event might be canceled if there was lightning. However, I didn't hear any thunder overnight, and when we stepped outside this morning to leave for the race, the streets in our neighborhood were dry. Weather.com persisted in forecasting that storms would begin at 7:45 am, but when we arrived at Piedmont Park around that time, the sky was only partly cloudy, the sun was up in the east, and it looked like we would have a nice morning. After picking up our bibs, I warmed up by returning to the car, exchanging my running rain jacket for sunglasses, and ran back to the starting area, for a warmup mile with Brian. But by 8:30 am, the sky had become cloudy, and the wind had picked up a bit, with occasional rain drops in the air. I decided to run back to the car, leave the sunglasses behind, and came back wearing the rain jacket. Unfortunately I was a little warm, but decided that I would run with the jacket. The volunteer apologized when she gave me the bib - I assured her that I wasn't superstitious. Shortly before 9 am, the runners lined up behind the starting mat. Brian was holding the flag - he claimed that it wasn't that heavy, so he was going to run the race with the flag! He and I lined up together about 20 feet behind the starting line, leaving plenty of room for faster runners to line up in front of us. 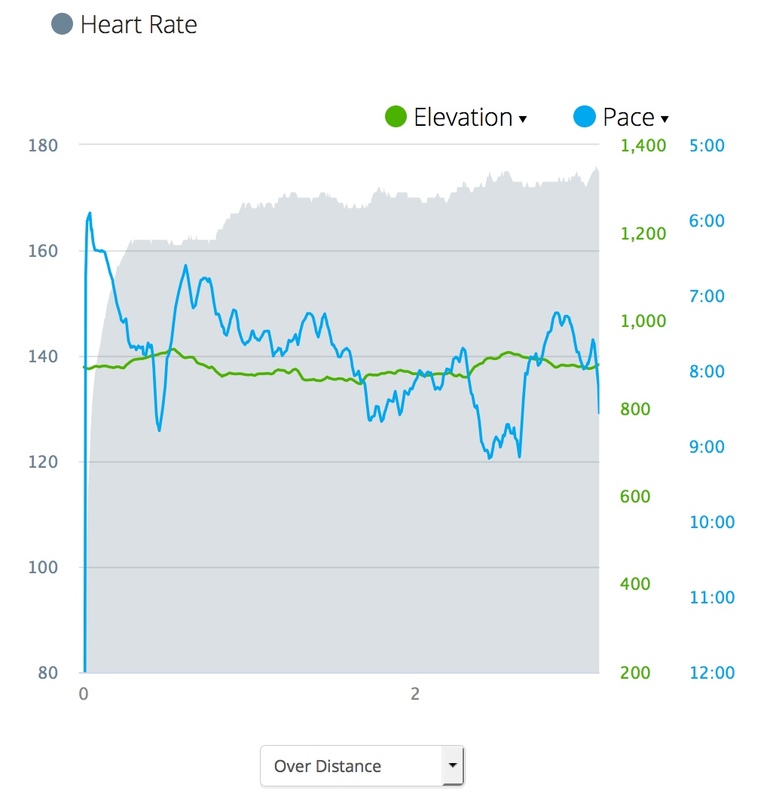 I told the runner next to me that I was only trying for 25 minutes, so faster runners should move up in front of me. But no one stepped forward! Finally, the race director made initial announcements, and it was clear that she was about to start our race! I motioned to a group of young men / teenagers that they should move up, but they didn't step forward until Brian and I also moved up to the starting line. The race director counted down, "Three, two, one, GO!" and we took off! I knew that it was a mistake to start out in front, as several other runners sprinted past in the first 10 seconds. I tucked in behind Brian's left shoulder, and matched his pace fairly well for the first mile. I was running far too fast, sub 7 minute mile for the first half mile, and slowed a bit as we began going uphill on the west side of the Active Oval. As the race continued past the mile 1 marker, Brian appeared to gradually open a bit more of a gap on me, although I could always see the flag! Volunteers were manning each of the many turns in the route, so it was probably impossible to get lost, but I knew where each turn was coming as I watched Brian with the flag make the turn shortly before I arrived. I was a bit concerned when someone passed me wearing a yellow shirt, as he looked like he might be in my age group! But I was still in contention for second place age group. the route going counterclockwise around the Active Oval. A couple of young men wearing the race T-shirt had sprinted past me and Brian in the early going. To my surprise, they both stopped about 12 minutes into the race, as one of them retied a shoe, and Brian and I passed them! Then a moment later, here they came again, at what I estimated was a 5 minute per mile pace. Somewhere past the 2-mile mark, they both stopped again. I think one of the guys was badly winded (as if I wasn't! ), the other was running more slowly and looking back at his friend. Brian shouted as he passed them "Don't let the flag beat you!" I remained silent as I passed, not wanting to egg them on, but I was determined to make them work for it if they tried to pass me again. In fact I never saw them again until after the race! Late in the third mile, I heard steps behind me, but it was a different young man. He said something encouraging as he passed me, I don't quite remember exactly what he said, but I looked over and said "At least you're not in my age group!" as he pulled away. The hills were not as difficult as in yesterday's race. It also helped that it was cloudy and a little cooler this morning! Although I could hear cheers at the finish line, it seemed to take forever to get there! But as I reached the finish line, I didn't hear anyone coming up behind me, crossing at 23:59. Brian Adams captured my finish on video, although unfortunately it doesn't seem to show on this platform. 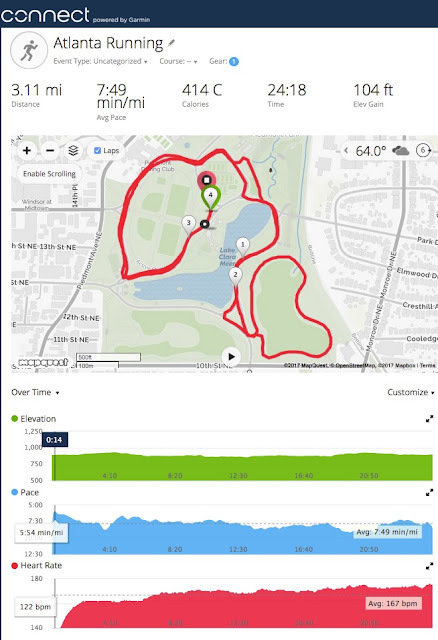 I checked my watch after the finish line, 3.08 miles, so I kept jogging a little longer until the watch read 3.11 miles, stopping the watch at 24:18. That was one of my faster 5K times! My mile splits were 7:21 (too fast), 7:55 (just right), 8:08 (running low on gas), and about 7:30 min/mile pace for the final push. We watched and cheered as the rest of Team Green finished, first Richard and Nikki pushing a stroller with Greyson, age 2; then Beverly, Angelic, Ntumba, and Bonnie. 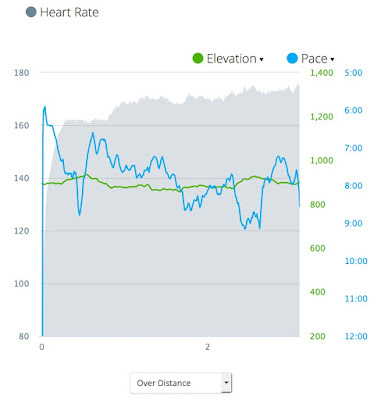 I had thought that the route was originally a bit short, but some of the later runners reported that they recorded distances of 3.11, 3.13, and even 3.2 miles. So perhaps it was my Garmin that was off a bit! 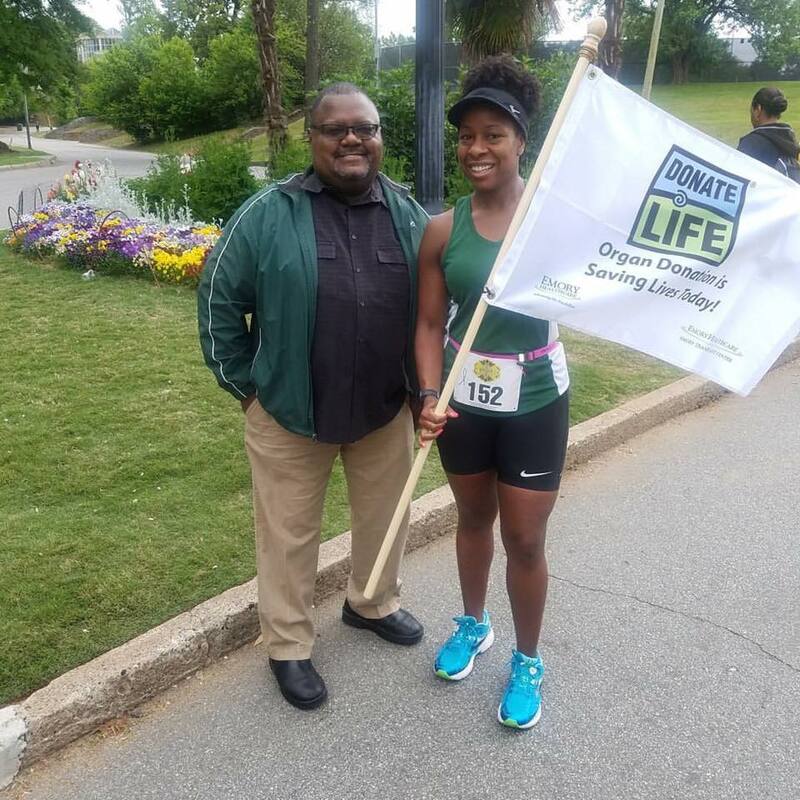 Before the awards presentation began, the arts director of DeKalb County shared that he was an organ recipient, a gift that had saved his life. The race organizer then announced that the largest team was Gabe's Gang, bringing 73 participants, many wearing team T-shirts with a photo of Gabe, who had died as a young man in December. His family donated his organs, and his mother accepted the trophy for bringing the largest team. It was a bittersweet moment, with Gabe's mother and the race director trying to hold back tears, as the rest of us gave the biggest applause of the day. Several of us in Team Green had a feeling that we had a good chance to win age group awards. Indeed, Nikki and Richard won bronze and silver in their age groups! One of the young men in the race T-shirt that we had passed won bronze in the male 14 - 19 age group, after which I said to Brian, "Now I'm gonna be disappointed if I don't win something!" The young man who passed me near the end won gold in the male 20 - 29 age group. The older man wearing the yellow shirt who had passed us early in the race was a surgeon who had performed successful transplant surgery on one of the speakers! Brian and I were trying to guess the doctor's age - I thought that he was just a few years younger than me, still in my male 50 - 59 age group, whereas Brian thought that he might be in the male 40 - 49 age group, in which case he had beaten Brian. We joked about going up and asking him his age, but before we could ask the inappropriate question, the awards were announced for the male 40 - 49 age group: The doctor won gold, followed by Brian winning silver. 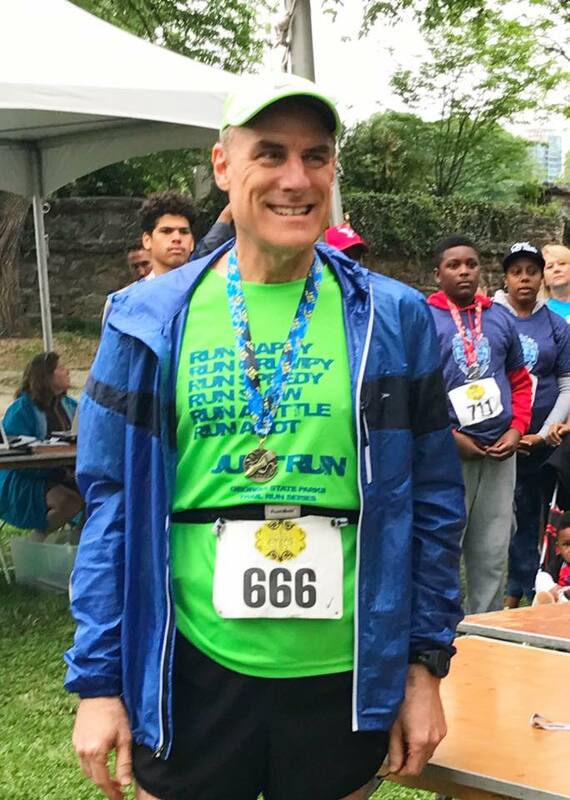 After announcing the female 50 - 59 age group winners, they called my name as the gold medalist in the male 50 - 59 age group! I haven't seen the final results yet. I'm hoping that I ran the fastest of the grandmasters (age 50 and up), although that will have to wait for publication of the official results. I really like the medal! I was concerned about running two races on the same weekend, but I'm happy to report that I'm not too sore this evening. I had a great time in both races! Today's race was also well-organized, on a nice route in the park without any competition from vehicle traffic, and I look forward to doing it again in future years. 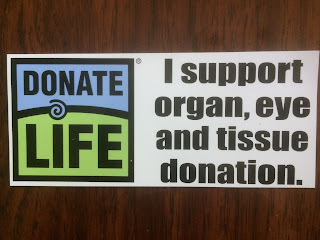 Although my driver's license has identified me as an organ donor for decades, this afternoon I also registered with the Donate Life Georgia website. 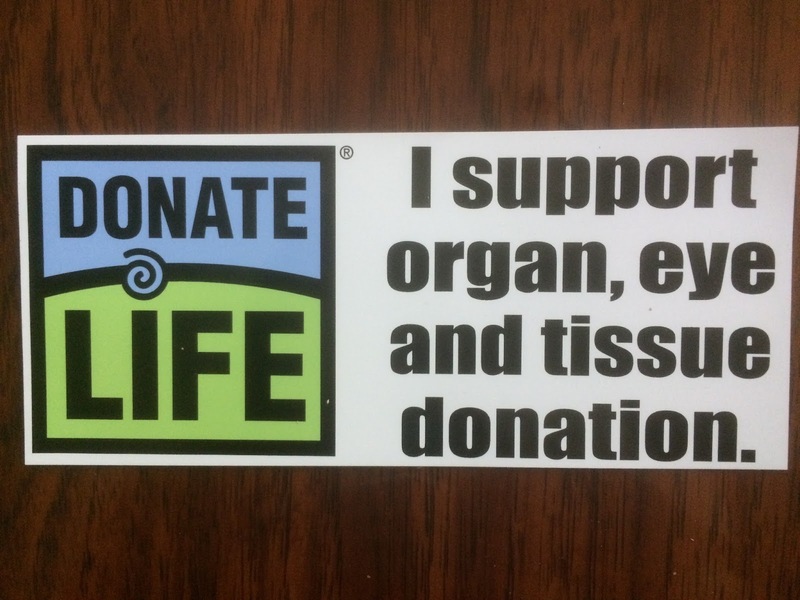 I encourage you to learn more about organ donation, and to register yourself if you are inspired to donate.